With a new year comes new ideas, plans and hopes. For those running their own websites, businesses and blogs, this often means that the new year is an opportunity for growth and improvement. This is easier said than done, but any brand that is willing to roll up their sleeves and focus on the important work of SEO can expect to see gradual yet meaningful results over time. Not everybody has the resources to hire a full-time SEO firm or consultant, which is why it is important to know where to focus your efforts. Today, we’ll review some simple do-it-yourself tactics for improving SEO in the new year and generating the growth you deserve. While keywords no longer provide the same benefit they once did in search, there is still value in the context clues they provide to Bing, Google and others. Since search engines rank websites based on their quality, context clues and authority, you want to convey as much information as possible to them with every piece of content. Long-tail keywords are especially valuable these days, for two reasons. First, shorter keywords and phrases have so much competition that it is very difficult to break into SERPs if you are new to the game. Secondly, pinging search engines with less obvious and intrusive keywords and phrases will not potentially be seen as a form of keyword stuffing when done properly. SEO in the new year may not seem much different than SEO in the old one, but a new year means time for shifts in your broader priorities. One area where you’ll want to make a shift is in the use of videos. While videos can be more difficult to produce, the amount of benefit they’ll generate for you – not just in the SEO arena, but on social media and beyond – is substantial. As more and more people own more advanced devices, their expectations regarding content continue to increase. Rather than forcing your readers to absorb information via standard text, adopt a more video-focused approach. Search engines love rich content and when properly attributed, you’ll be rewarded for it. The gradual shift of SEO algorithms continues apace, with an increased focus on EAT. Expertise, authoritativeness and trustworthiness are among the most important elements of a strong SEO campaign. When pinging search engines with content, there are many different ways that they analyze content for these factors. Long story short: by focusing on improving your relationships with followers, encouraging the use of sharing and associating your brand with more established entities, you can generate more trust in your brand – among people and search engines alike. The name of the game in 2017 for SEO revolves around trust, multimedia and advanced keyword usage. If you build a strategy that focuses on these three different elements, then you’ll be well-set for a year of strong performance. 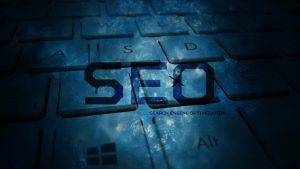 There are of course many different SEO elements that need to be pursued in addition to this, all of which help improve your standing in search. Tell us below about which additional strategies you intend to focus on in the new year. « What’s Causing My High Bounce Rate?